﻿ India's Most Wanted Teaser Poster out ft. Arjun Kapoor on Mission! Back in August 2018 Arjun Kapoor have kick started shooting of the film India’s Most Wanted directed by Raj Kumar Gupta. Now, First Look Teaser Poster have been revealed. 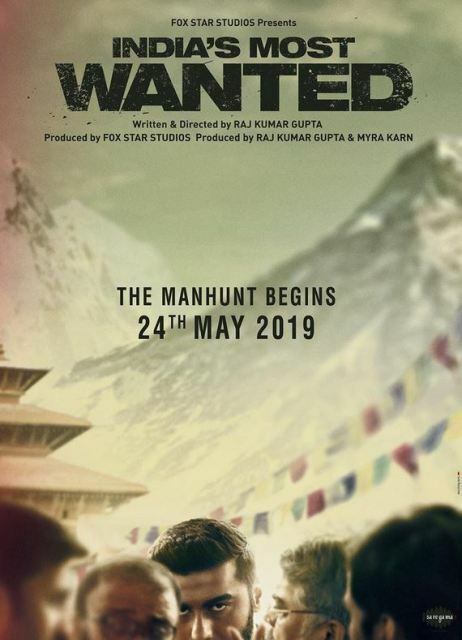 The film India’s Most Wanted is about tracking a terrorist in a secret mission and arresting him without firing bullets. It pays tribute to unsung heroes of our society. Arjun Kapoor and Amrita Puri are the lead actors in a film. Arjun Kapoor will be seen Playing role of Intelligence officer. The film India’s Most Wanted is the Mission based film about finding and arresting Terrorist. Teaser Poster have been out and its been written on that, “The ManHunt Begins”. India’s Most Wanted Teaser Trailer to be out Tomorrow. The Film is directed by Raj Kumar Gupta who has given Big Hit films ‘No One Killed Jessica’ and ‘Raid’. The film India’s Most Wanted is Produced by Fox Star Studios, Rajkumar Gupta and Myra Karn. The Film Scheduled to release on 24th May 2019.